1. Go to your Form Builder and click the PUBLISH tab. 2. Click EMBED on the left nav then click LIGHTBOX. 3. On the next page, you may copy the code as is by clicking the green COPY CODE button. 4. Or, if you want to further customize the look and feel of the lightbox, click the CUSTOMIZE button. To see how it looks like, hit the PREVIEW button. 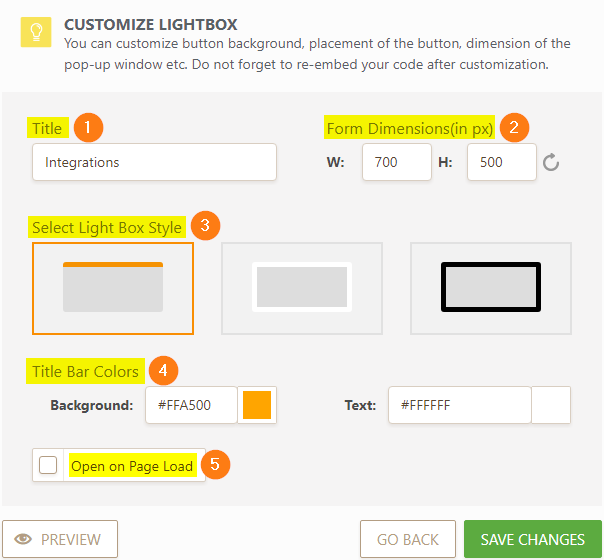 On the customization section, you have options to change the lightbox TITLE, FORM DIMENSIONS, STYLE, COLORS, and an option to OPEN ON PAGE LOAD or not. 5) Don't forget to click the SAVE CHANGES button then copy the generated code. You need to replace 1234567890 with your actual Form ID. The class="" value is very important for the lightbox to work when the image is clicked. The Form ID is the string of numbers at the end of the form URL. The IMAGE URL HERE should also be replaced with the actual image URL. You're done! How did it go? Were the instructions clear enough? How can we improve them? Please share your comments in the section below. So, if I have an image on the form I need to customize it? Where do I put this code once I copy it?? You need to dumb down the coding language for laypeople. How do I hide, get rid of the white background AREA up to the form itself? I want the popup lightbox edge to be the forms edge. once we are done creating the Lightbox code, where do we paste it in to wordpress? It was working fine, but now 2 lightboxes open, and the one on the front is empty. The full one is underneath. How do I stop the empty one to load, or at least how do I get the empty one to load behind? In Wix, you can't input a code. How am I supposed to embed the lightbox form? Hi, These instructions worked for me. I can see the form as a pop-up lightbox. Now, how do I make it visible on each page. I'd like my clients to click on any of my products and automatically add them to the form. Is this possible. BTW, you guys are great. Where do we insert the lightbox code on a Squarespace site? the width and height of the lightbox can obviously only be specified in absolute-values (like e.g width='600px'), hence I remain unable to use lightbox on smartphones ! it seems I can only work with px-values - if this is true, I cannot use 'jotforms lightbox' at all.. that is a pity. 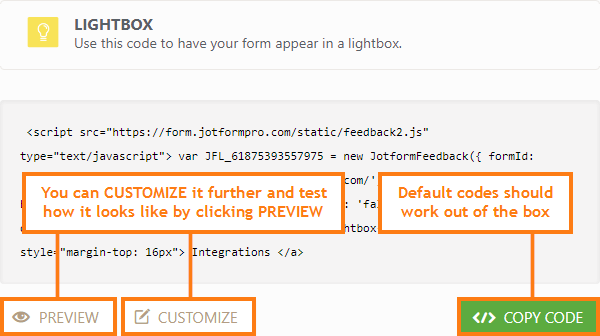 Dear support: Can you advise how to use lightbox via jotform propperly for smartphones? any way to make the actual framing of the light box taller? form dimensions only affects within the frame. 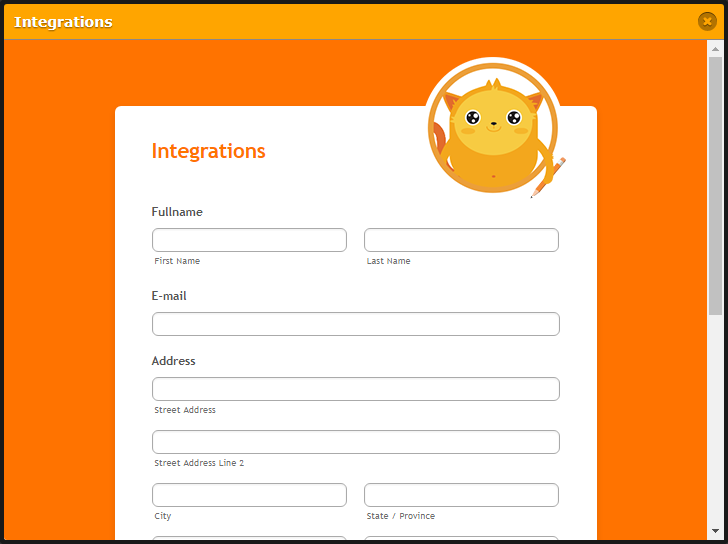 hi i want to add form like simple lightbox as popup form so when i clicked the button its open up that lightbox form ,but i dont know how to add to codeigniter.when i open that form it should open up codeigniter controller link with created view page with dynamic data.can u help me? So, what about WordPress? How does it work in WordPress? This did NOT work with my shopify site. how i can create a lightbox form with a button instead of text to open? is it possible to let a lightbox widget appear, right when coming on a landing page, so without clicking anywhere? When I past the code on html widget in iweb, lightbox doesn't work... Why ?